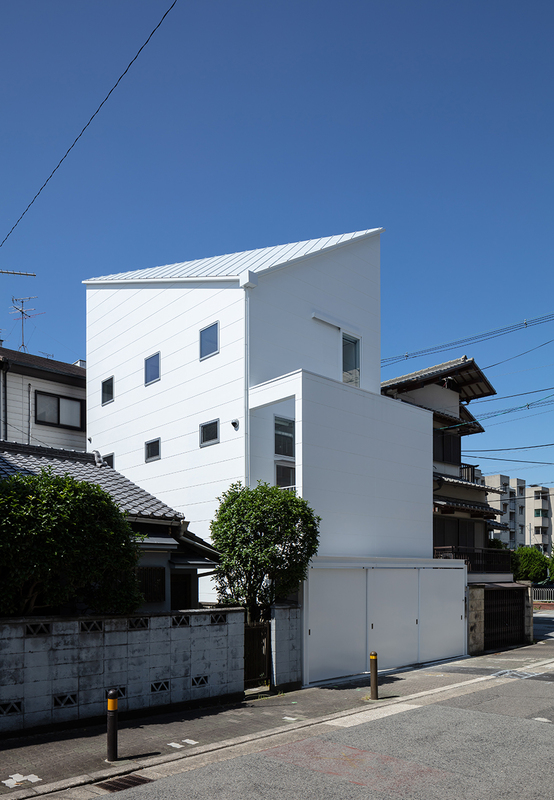 This house was designed for a family of three. 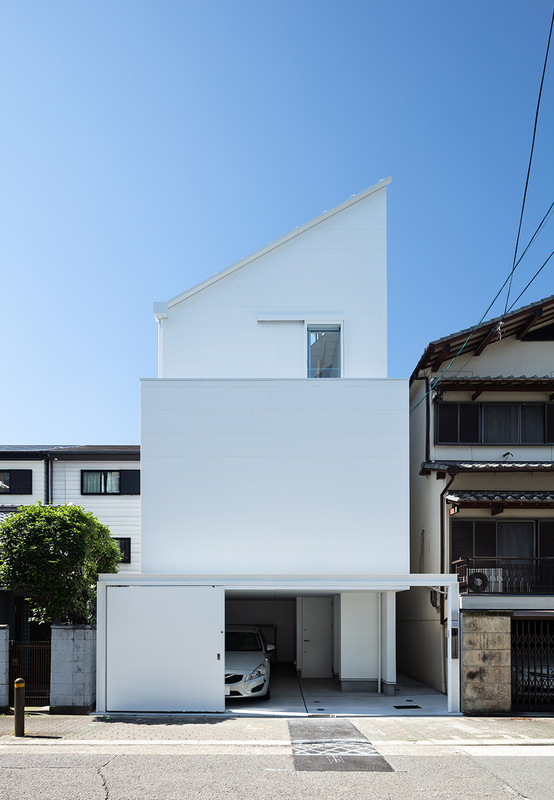 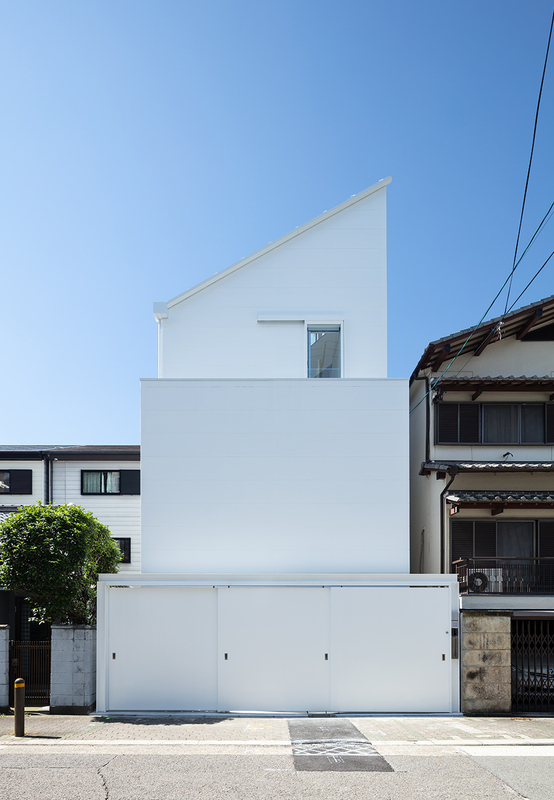 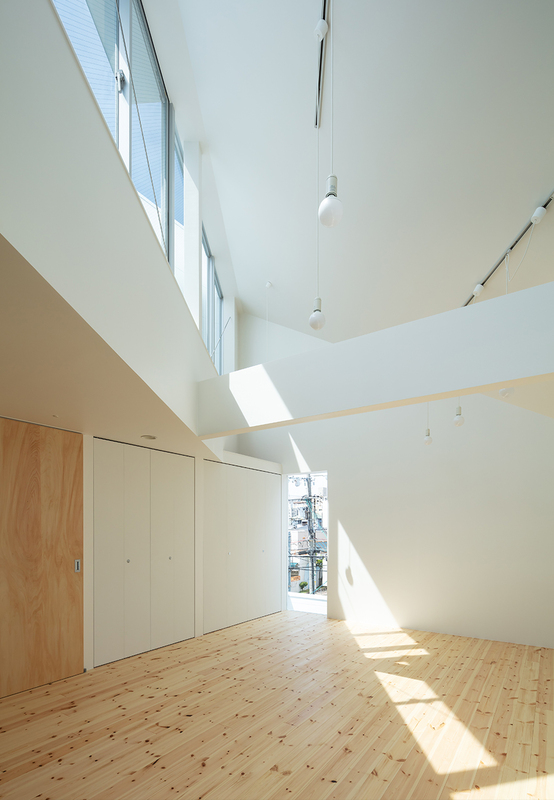 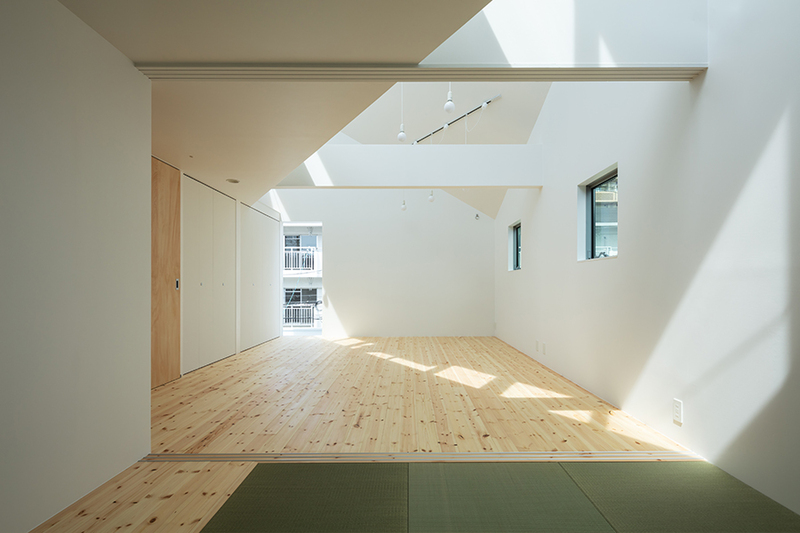 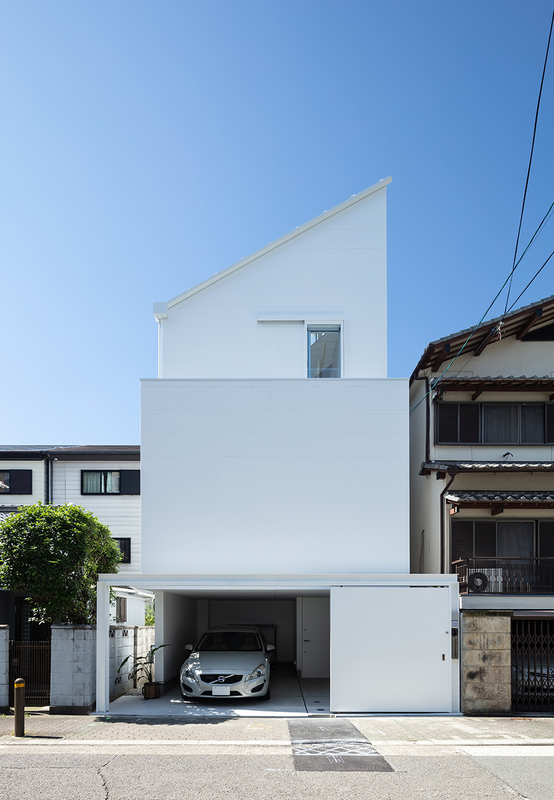 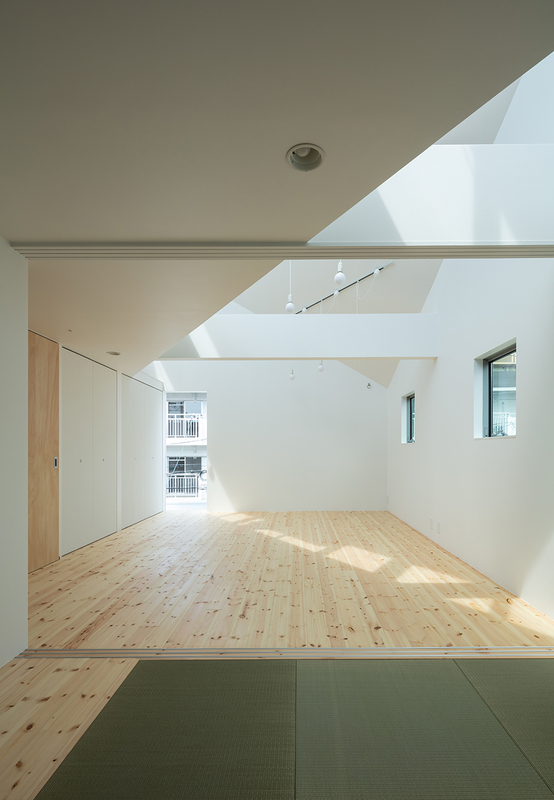 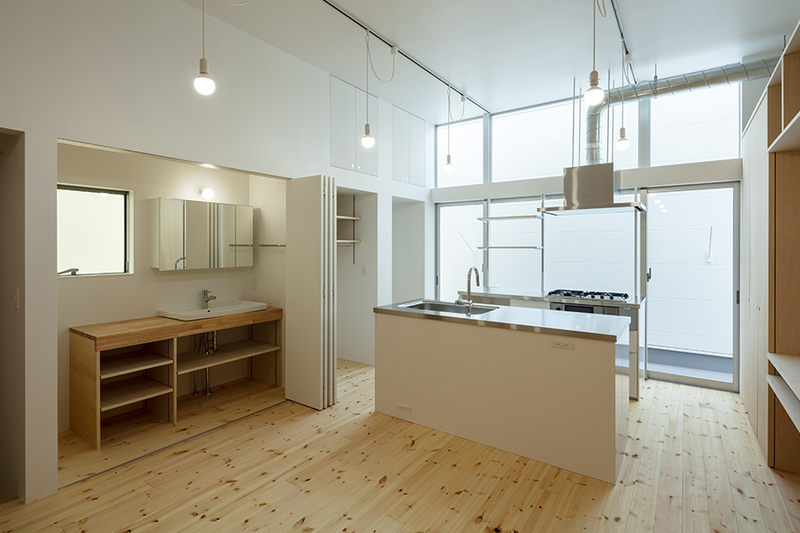 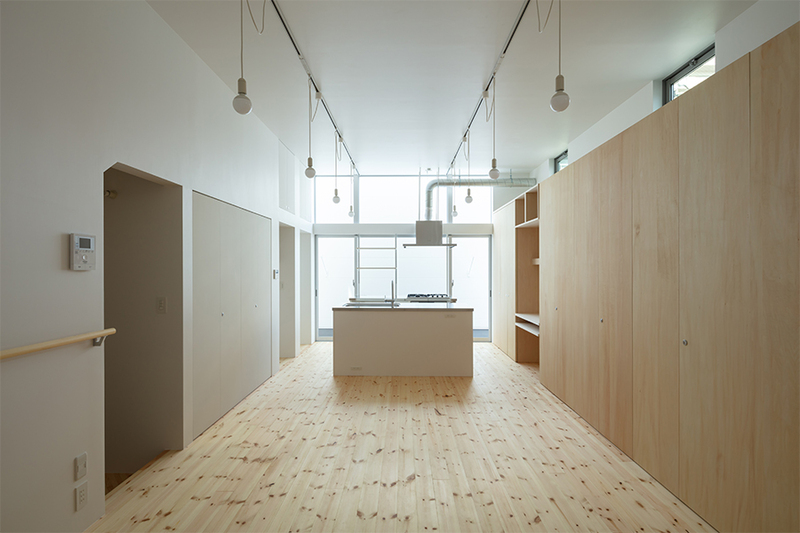 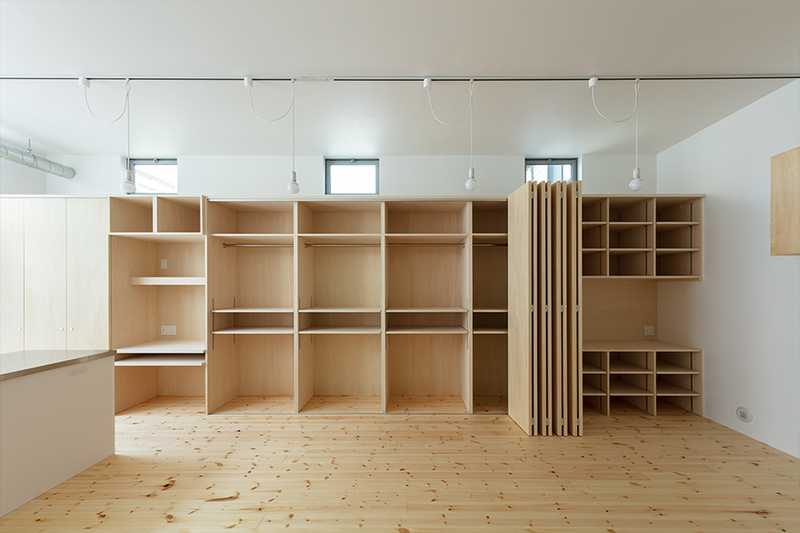 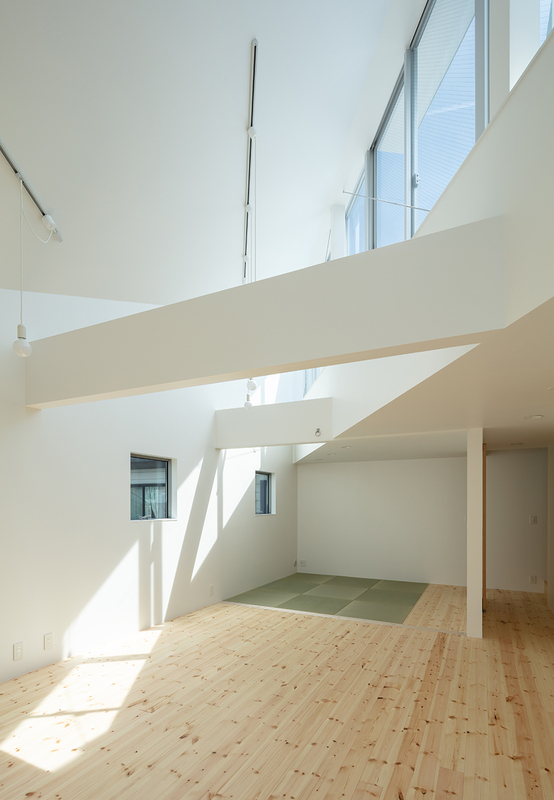 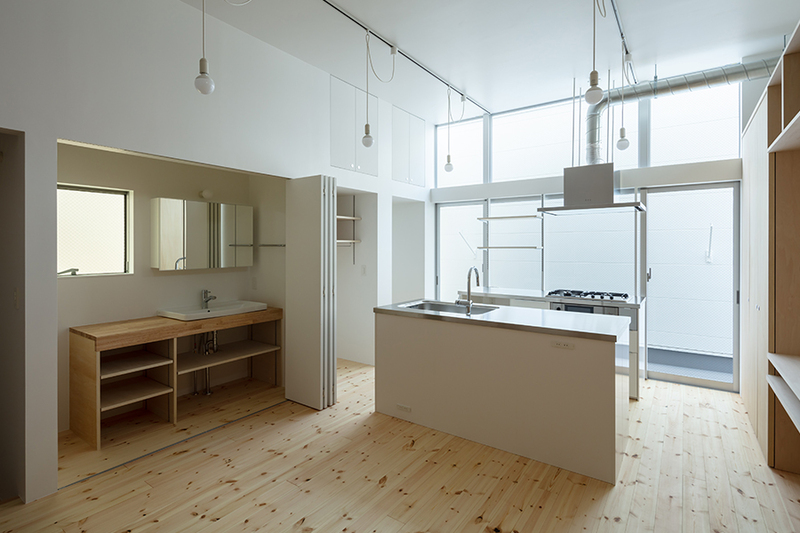 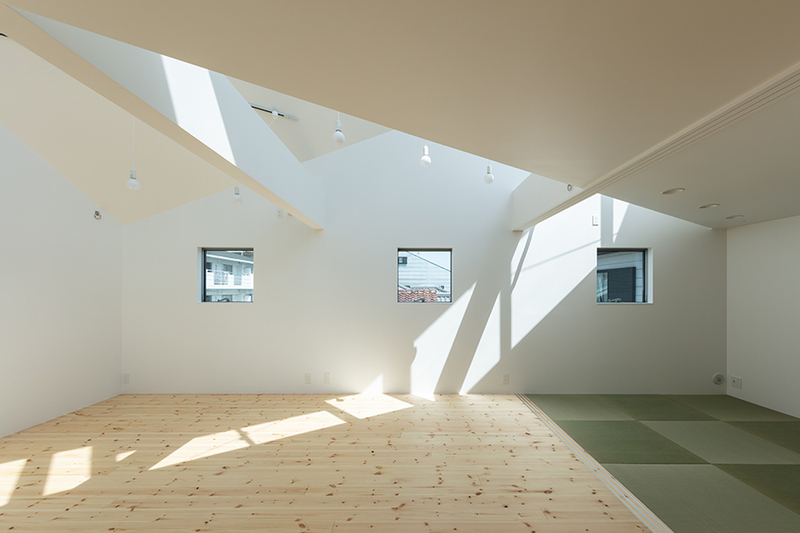 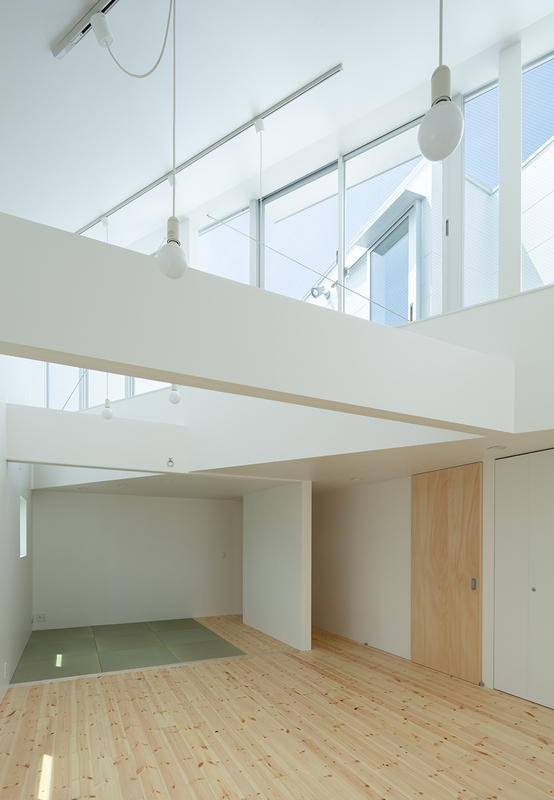 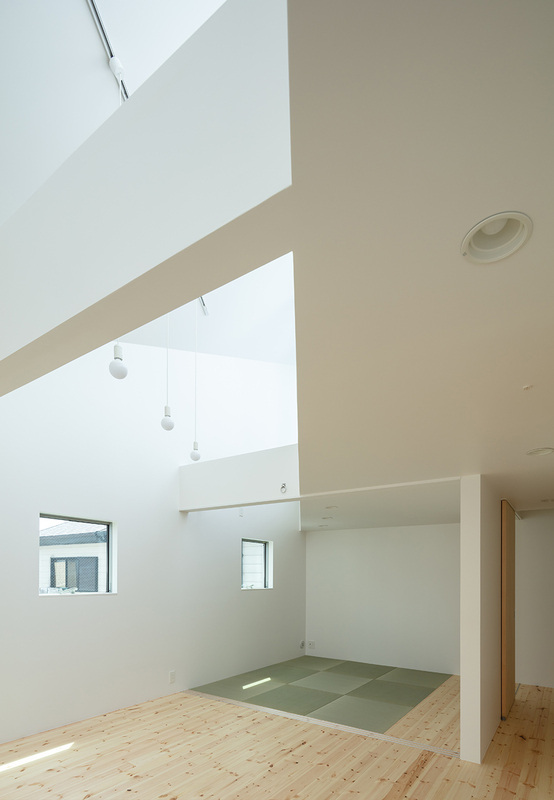 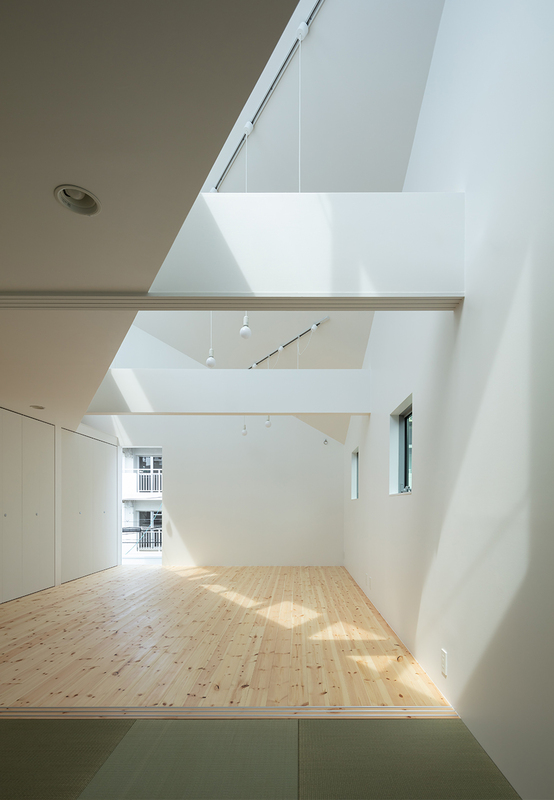 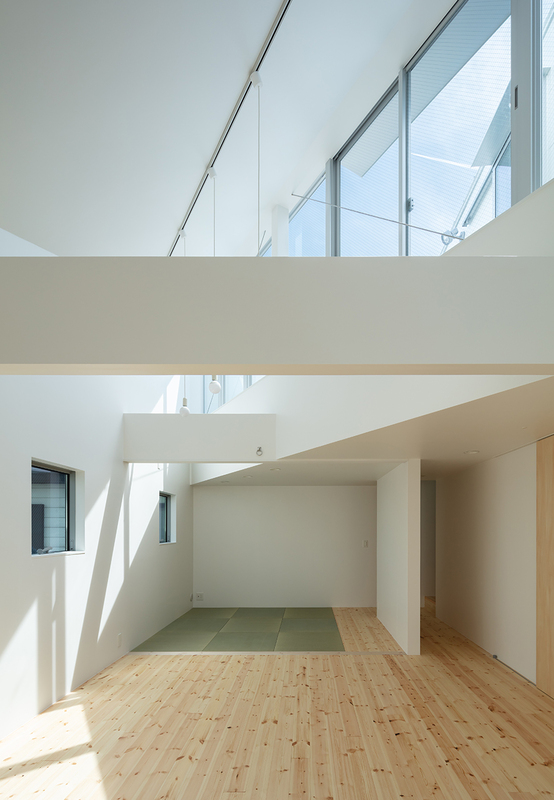 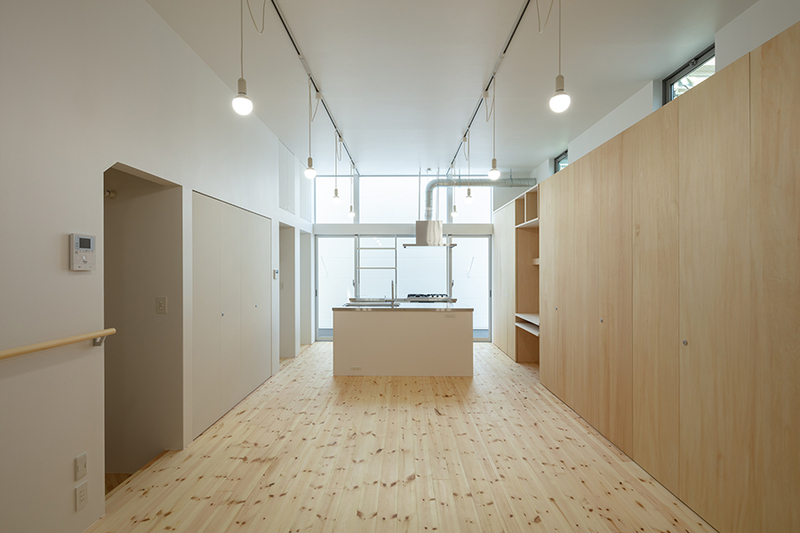 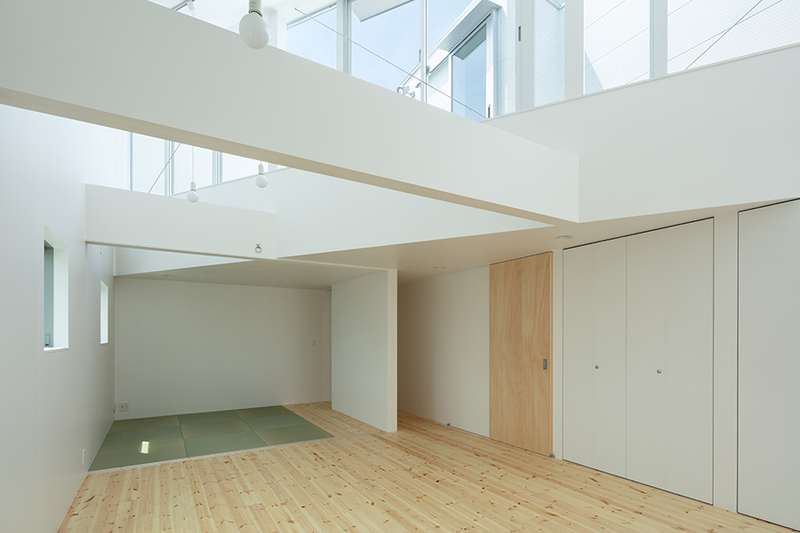 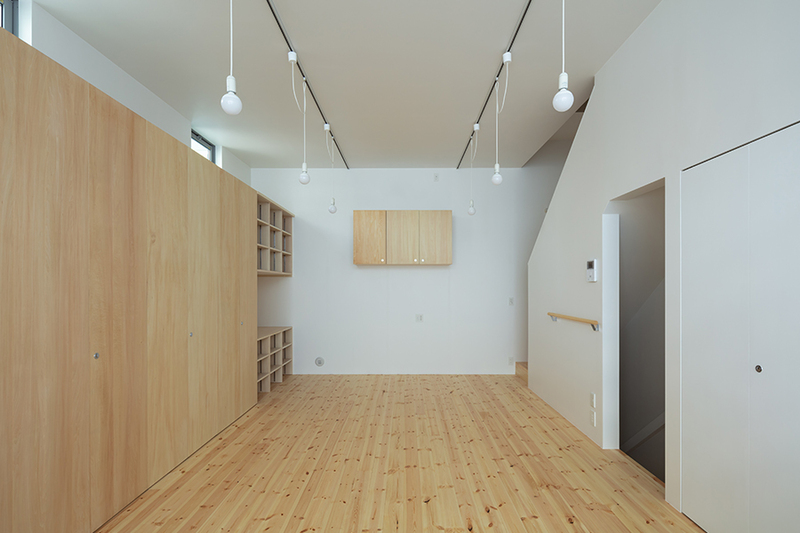 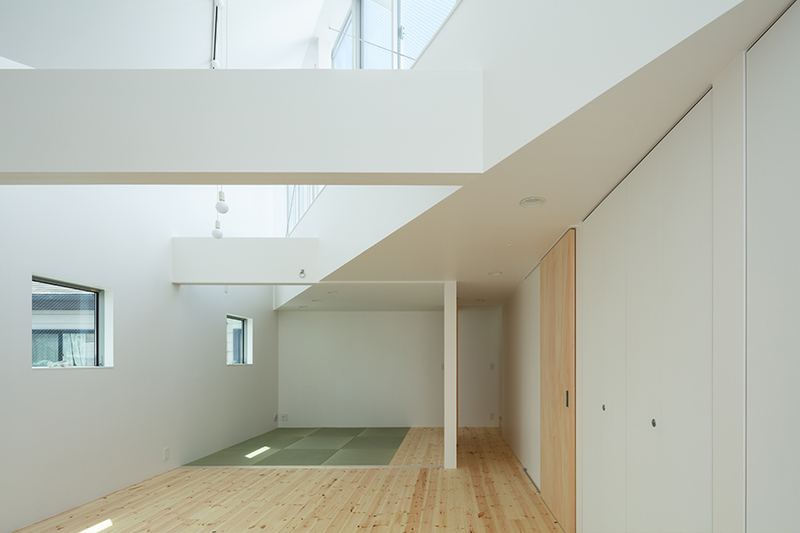 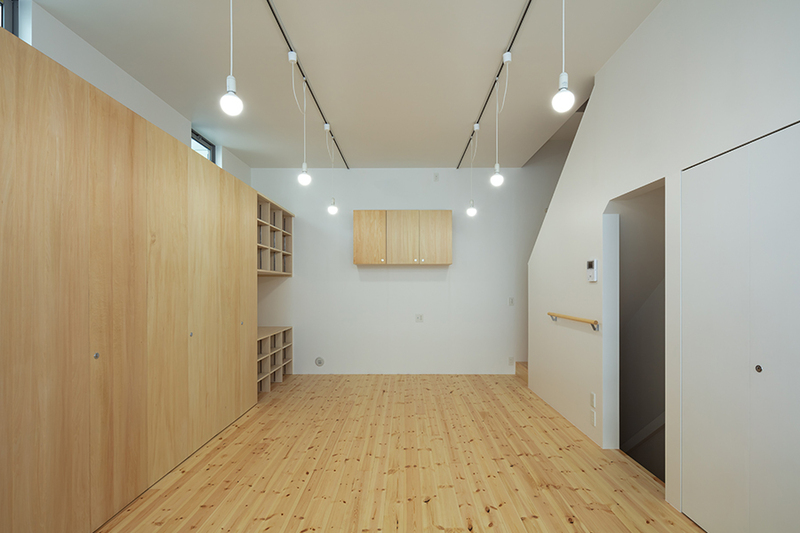 The site is located in an urban area in the city of Osaka where houses, nurseries, elementary schools and parks coexist together. 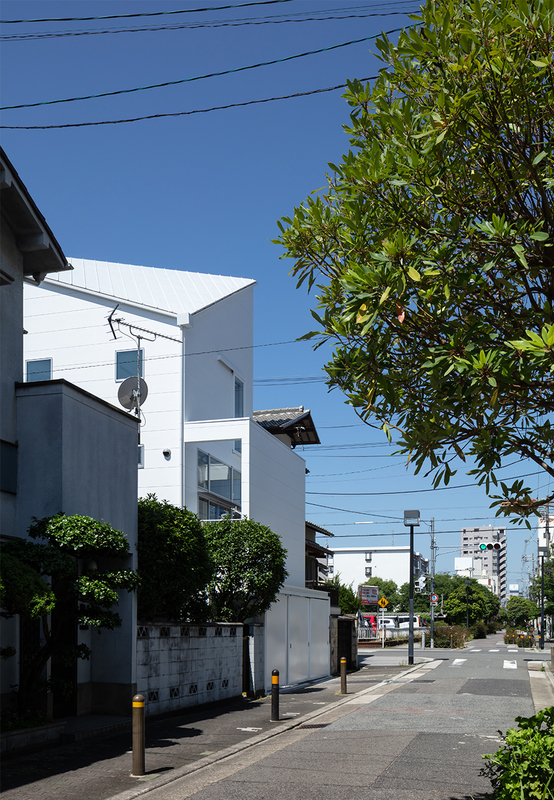 The owner’s former house built on this site was a wooden three-story house of which south and west sides have been built up, and therefore the north front road and the space on top of low-rise buildings on the east side were the only ways for natural light to come through. 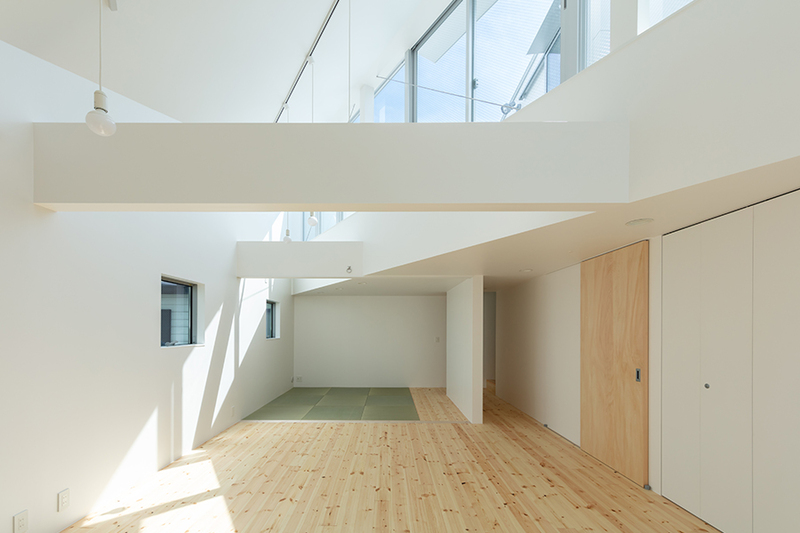 The owner requested to bring more natural light into the house and to secure privacy from the four-story rental housing across the north road. 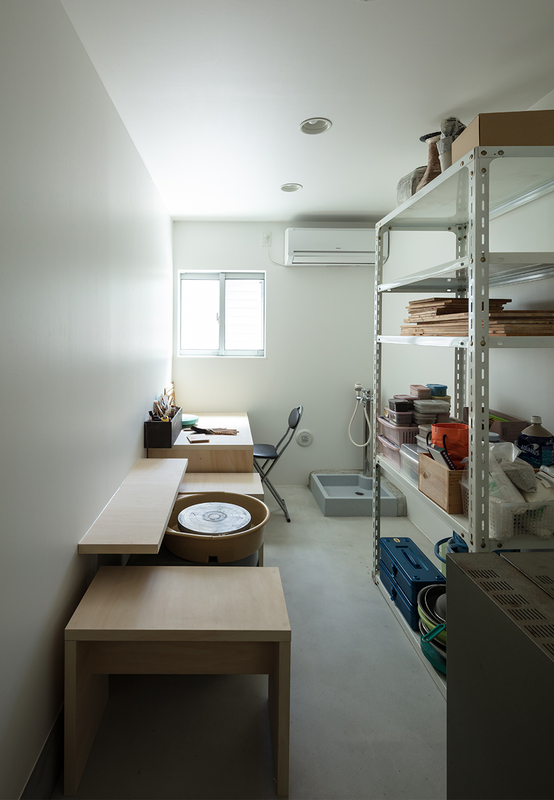 We then decided to place garage, pottery atelier and bathrooms on the ground floor, combined living room, dining room and kitchen on the first floor for the owner’s wife to open a cooking class in the future, bedroom on the second floor, and roof terrace on the roof. 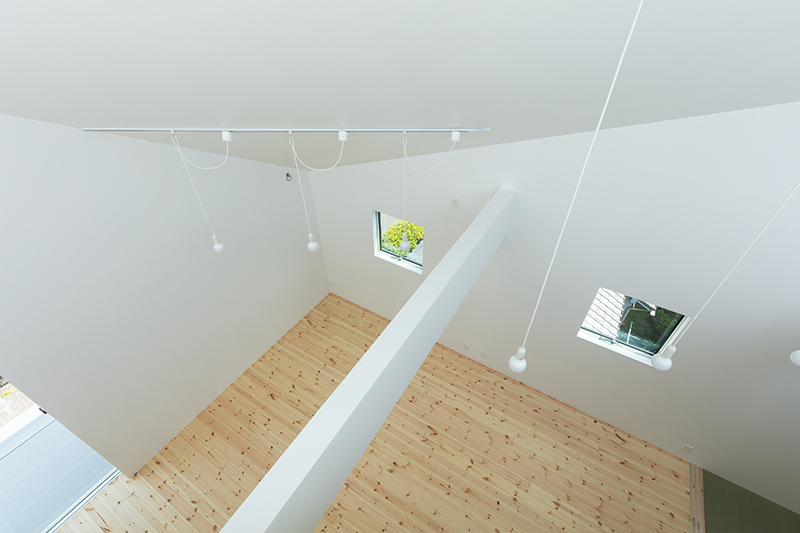 Since a large window to let in more natural light cannot be installed on the north front road side without making some modifications in terms of securing privacy, we installed a wall on the balcony on the first floor for shutting out neighbors’ sights and letting natural light into the combined living room, dining room and kitchen from the upper space of the balcony. 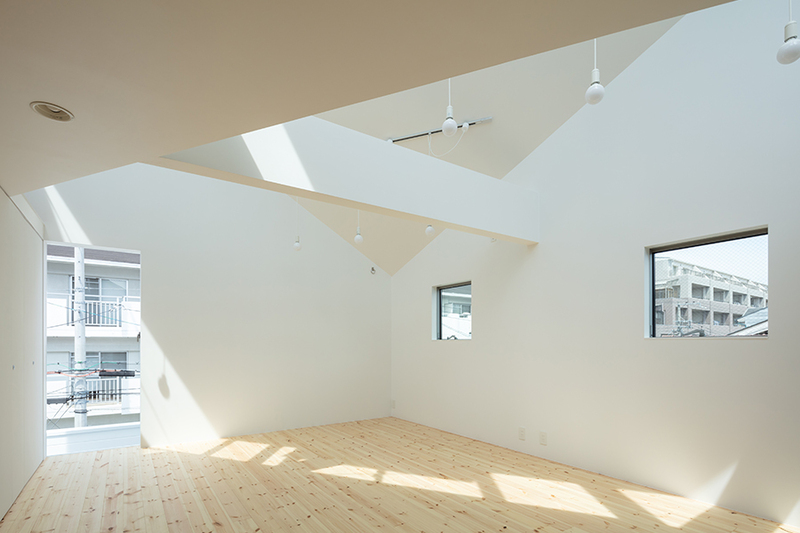 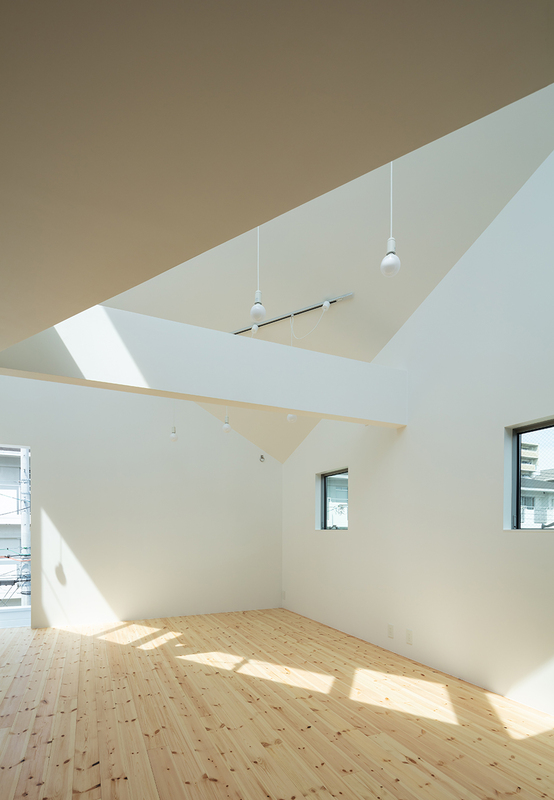 The roof (ceiling) of the bedroom on the second floor is folded upward in the diagonal direction and high side lights are installed to allow natural light from the southwest sky into the room. 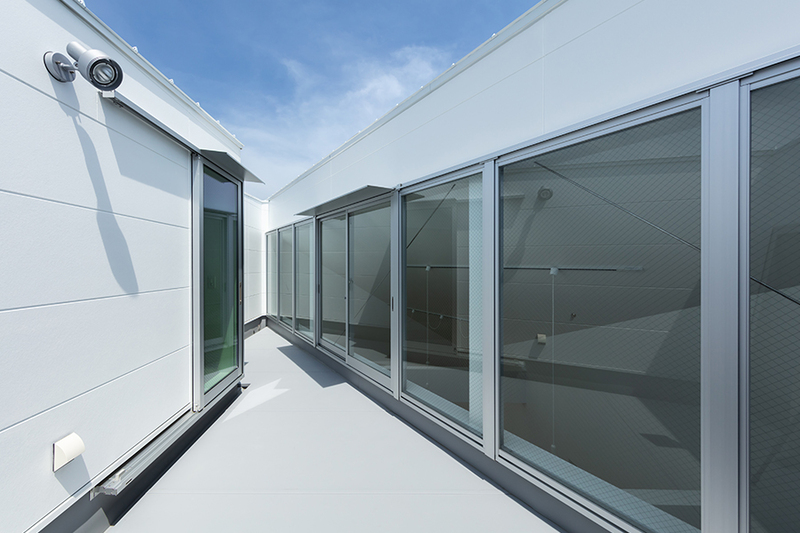 The roof terrace is surrounded with walls to ensure absolute privacy. 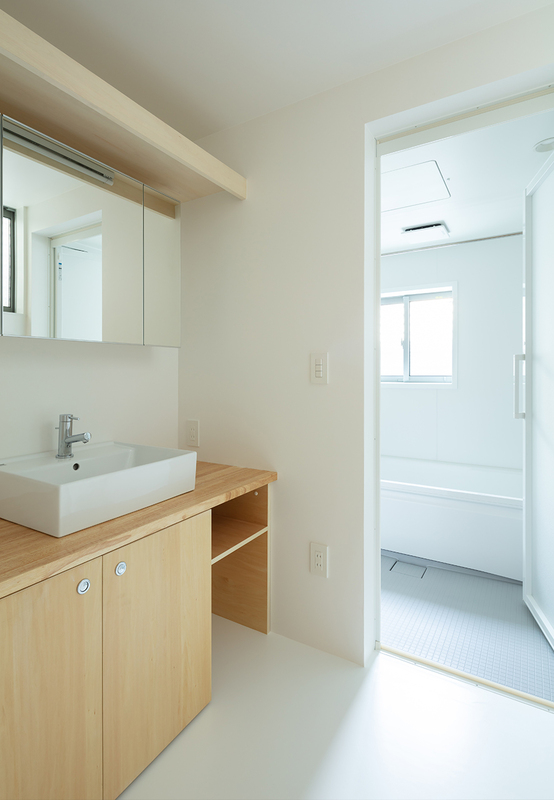 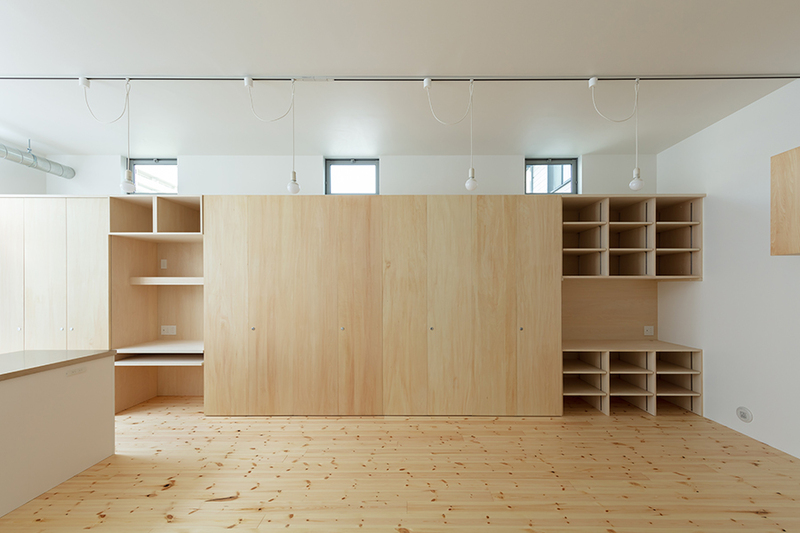 For the interior, we aimed at creating a quiet and peaceful space with woods and white walls.